Could USS McCain Have Been the Victim of Cyber Warfare? Yesterday, during a condition of calm sea and high visibility, a Naval vessel, the guided-missile destroyer USS John McCain, was rammed broadside by a merchant vessel oil tanker, damaging the US Military vessel to the point of massive flooding of a hull and berthing area where soldiers were sleeping. 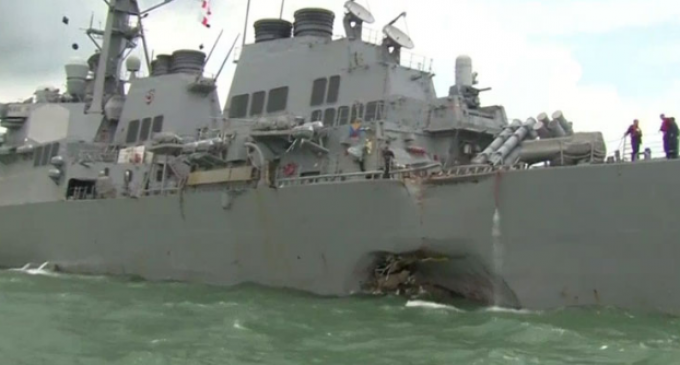 As of this report, 10 sailors are missing and 5 more are injured. The first thing that comes to mind in a wreck of this nature is, how did a vessel attached to the greatest fleet on the face of the Earth manage to be breached by a commercial vessel in calm waters and conditions of high visibility. A recent Senate investigation into electronic parts supplied to our military vehicles, aircraft and vessels may point to an answer to this intriguing question. According to the report, the investigation found that Chinese companies that were supplying the US military with its electronic parts for our hardware were actually counterfeit parts that were substandard and being sold at full price to the US government as original equipment. If counterfeit parts are responsible for substandard performance, is it possible that the USS John McCain NEVER SAW THE APPROACHING MERCHANT VESSEL? Turn to the next page to read more about the possibility of a silent war being waged on the US military that involves a cyber warfare that we funded ourselves! Two ship within a short time period ?? What do these ships have in common ?? They both have the equipment that shots down the missiles the NK keeps threatening to launch …..HUMMMM ?? Yeah, you do wonder what the hell is going on. Why would you buy parts for your military ships from your enemies. Oh, I forgot, that was during the Obama administration when he fired 137 military leaders and cut the military budget leading the country unprotected against its enemies. Cyber attacks? What happened to looking out the BIG windows? It’s called defensive driving. That’s how I avoid idiots on the road. I find it hard to believe that this keeps happening to our ships! Someone or somebody is not doing their job! This is an embarrassment to the United States and the greatest Navy in the World! Something is very wrong with what is going on! Heads need to roll very soon!!! There is no question in my mind that someone wasn’t doing their job and heads need to roll. How embarrassing!! So agree with you that this should not be happening! What an embarrassment to this country and the US Navy! Cyber story prob a ruse to cover Captain asleep at the wheel. Really, it’s possible to SEE another ship is getting too close–right? What’s the excuse for poor human observation?